It may seem crazy, or a little out of your comfort zone, but think for moment -- how would you be transformed in El Salvador if you came with our group this July 18-25? Financial assistance is possible, the trip is safe, and you don't need to know Spanish. Right now on our website you can learn more about cost, travel, financial support, safety, what we'll be doing, and why going this trip could transform your perspective on faith, ministry, and human connection. Applications are now open. Think about it . . .
Friday marked the 27th anniversary of the assassination of a critical faith leader in El Salvador, Archbishop Oscar Romero. 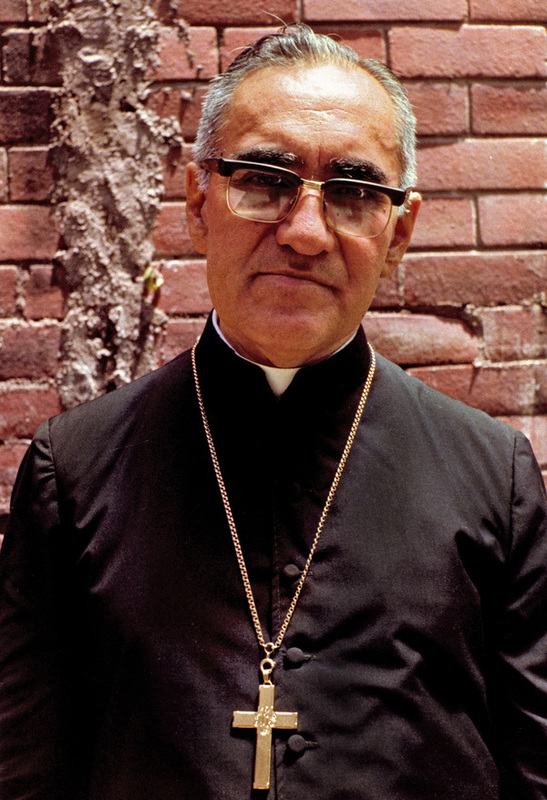 Using his influence as archbishop to speak out against poverty, social injustice, assassinations, and torture, Oscar Romero was well aware that his life was at risk. Just days before his assassination, he said, "You can tell the people that if they succeed in killing me, that I forgive and bless those who do it. Hopefully, they will realize they are wasting their time. A bishop will die, but the church of God, which is the people, will never perish." At this moment in 2017 he is under consideration by the Roman Catholic Church for canonization as a saint. After his death, The Lutheran Church in El Salvador continued the work of advocating for the poor and for peace under the leadership of Bishop Gomez (who preached here at Advent in spring 2015). Some courageous U.S. Lutherans traveled down to "accompany" Bishop Gomez during the civil war (1979-1992), which then literally meant protecting him from being murdered by government armed forces. Advent member and NYU student, Sojourner Travis, with members our sister church, Pueblo de Dios. Since the war, Lutherans around the United States have continued to "accompany" the Lutheran Church in El Salvador in a broader, relationship-centered sense. 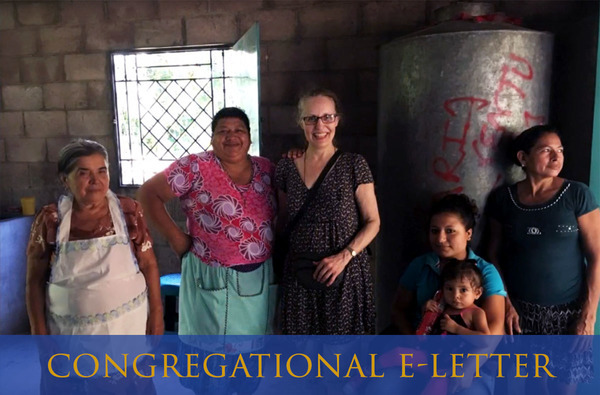 Our group from Advent travels down every year to spend time with our sister church in Calderitas, and our congregation supports them in prayer, communication, and financial contributions throughout the year. While our trip is safe, for most El Salvadorians poverty and violence are still grim realities deeply affecting their lives. But, instead of sorrow, in El Salvador we are met with overwhelming grace, gratitude, faith, joy, and fellowship. Pastor Christian Chavarria of our sister church says, "One visit from you is worth more than one million dollars to us." If that's so, what could this visit mean to you? Take a moment to learn more, and consider joining our Equipo El Salvador trip, hosted by the Lutheran Church in El Salvador, this July 18-25. For a few minutes each Wednesday evening in Lent, our sanctuary is overtaken by a quiet chorus of marker squeaks. You can almost hear the gears turning in everyone's heads as they mull over the brief reflections shared by members of our congregation like Union student Cassie Hartnett, Pastor Sudbrock, Djamilah Samad, and Jahanna Dillard. One by one, people rise and press their post-it note onto the north wall of our sanctuary, bearing their own handwritten insight of the night. To share some of these takeaways with you, high-school communications intern Lily Vaughn has taken pictures of our post-it wall, highlighting some of the reflections that stood out to her. Check out our photo album of the colorful insights shared at our Wednesday Evening Worship services in Lent. And come join us for our two remaining worship services exploring how we live out our baptism identity. 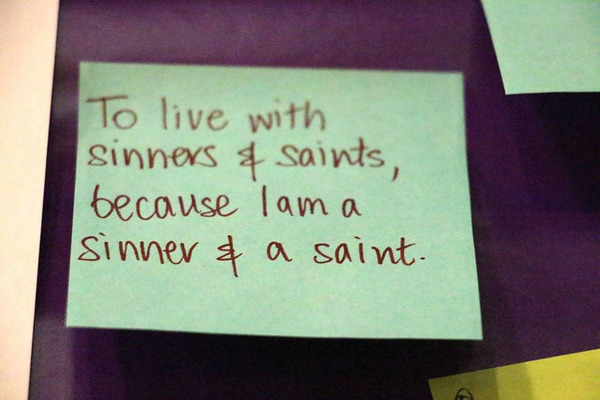 Here you can get to know new people over warm soup, hear reflections from different members of our community, and add your own thoughts to our Lenten post-it wall. We'll also get enjoy the jazz-inflected musical leadership of Deanna Witkowski these last two weeks. Help us invite new friends to worship with us this Holy Week! Palm Sunday is coming up soon on April 9. 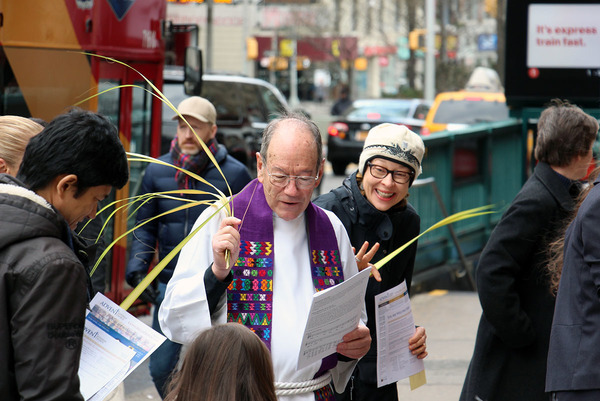 We are looking for volunteers to hand out palms and Holy Week postcards outside our building on Broadway leading up to, on, and following Palm Sunday. Click here to see the available times or let us know you're interested. 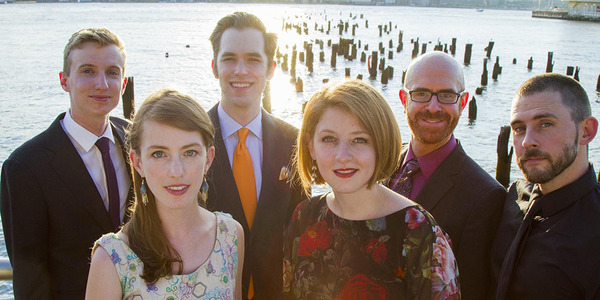 Enjoy great music, free to the community tonight at 7:30pm at this month's Music Mondays concert, featuring the Ekmeles vocal ensemble and the Attacca Quartet. Learn more here. Free tonight? Come help us do some outreach to college students from Columbia and the surrounding area. This is a student care and outreach opportunity for LaMP, an ecumenical college ministry our congregation supports. If you’re able to help, email pastorann@adventnyc.org. College students! Come join us for a free nacho bar tonight (Monday, March 27) from 9:30-11:30pm at Broadway Presbyterian Church on Broadway at 114th Street. What ministry or group will you be involved in this month? There are even more ways to connect in fellowship and service this March and April! Congregational Lunch | Starts at 1:45pm in the basement fellowship hall. Enjoy lunch in community, lovingly prepared by members of our Spanish-language worship community. Our Mission of the Month for March is ELCA World Hunger, which supports hunger projects in 46 U.S. states and 62 countries. Learn more about ELCA World Hunger here. If you have a Lenten bank as part of Sunday School's "God's Global Barnyard" drive, supporting this Mission of the Month, please return it in worship on either April 2 or 9.